This week, till the end of the day on June 5th, we are including a free Kidrobot Series 4 Dunny with every order! Subject to availability, of course. All of the S.4 Dunnys we have left are open-box (foil and all accessories intact, labeled & resealed boxes). Email us after your order to tell us which one you want. See pics of all 6 Dunnys together on our homepage. You can also sign up for our emailed newsletter there if you haven't already. Introducing Toys Vanvett from Spain! From left to right, above toys are called Tenguri II, Kapami, Kapari, and Tenguri. Retail will be around $45 to $50 per piece and each is a full 10 inches tall! Not sure how big the production run is. I suppose we'll find out more soon from them! FYI I did try to use Babelfish to translate the descriptions of the toys from Spanish to English for you, but the english translation was hysterically garbled so I trashed that idea. 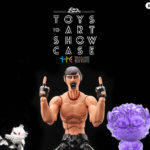 Will post up more info on these toys as it becomes available. Please do email us if you fancy these pieces. I am into the Tenguri figures in particular.